Mix the flour, almonds, sugar and salt in a bowl. Add the butter and rub together using your hands to form an even, crumbly mixture. Add the lemon zest and egg, and mix quickly to create a soft dough – do not knead. Flatten the dough, cover and chill for approx. 30 mins. On a lightly floured surface, roll out the pastry dough to approx. 2 mm thick. Cut out 12 circles (each approx. 11 cm in diameter), place in the prepared holes. Prick firmly with a fork, refrigerate for approx. 15 mins. Approx. 10 mins. in the lower half of an oven preheated to 200°C. Remove the bases from the oven, allow to cool a little, remove from the tin and leave to cool on a rack. In a pan, whisk the water with all the other ingredients up to and including the salt. Bring to the boil over a medium heat, stirring continuously. As soon as the mixture thickens, remove the pan from the heat, continue whisking for approx. 2 mins. Pour the custard through a sieve into a bowl, allow to cool a little, pour into the tart bases, leave to cool. 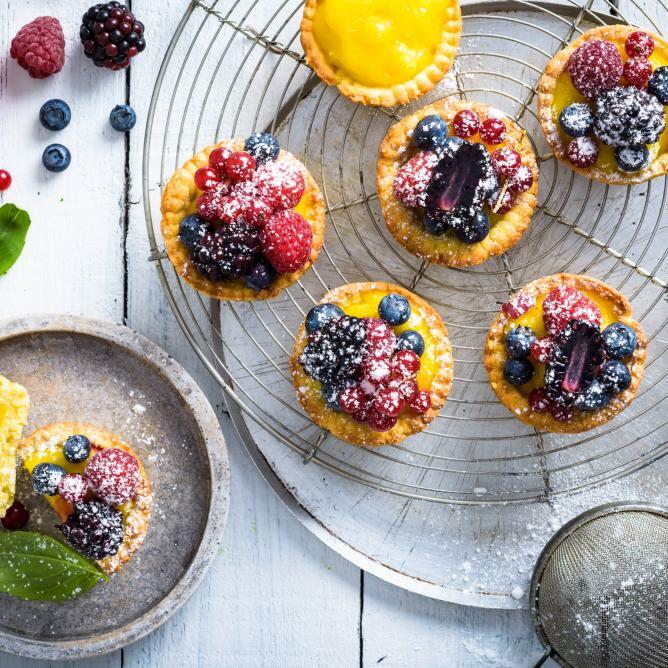 Decorate the tartlets with berries and basil.